\R will work in macOS 10.11+, in (I believe) any version of Keyboard Maestro. 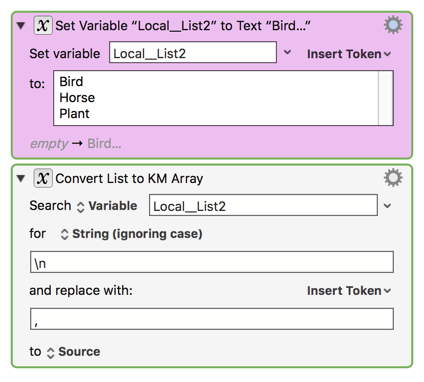 KM \n will match only LF in a Search and Search/Replace. BBEdit uses \n LF line endings internally, despite whatever the line endings of the text file are. It converts on load/save to the line endings of the file on disk. You can see this by changing the line ending popup, saving to disk, and using both File ➤ Hex Dump Front Window and File ➤ Hex Dump File. The former always shows \n (0x0A), while the latter shows whatever is configure. And it seems that its regex has somehow been configured such that \r and \n both match the internal \n characters. \r will match line endings, and \n will match line endings, and \r\n will match only if there is two line endings in a row (ie, a blank line). Someone from Bare Bones would have to comment to know more for sure. 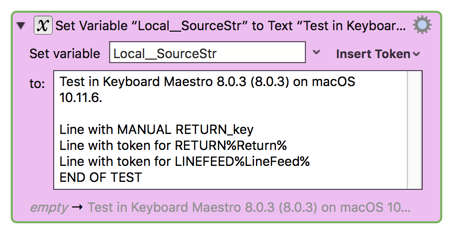 And no, I wont be messing around with the regex in Keyboard Maestro, \r is CR, \n is LF, \R is the best thing to use in Keyboard Maestro as long as you’ll never see OS X 10.10 (which kind of makes me wish I had made Keyboard Maestro 8 require 10.11+), otherwise (? :\r\n|\r|\n) or the equivalent is necessary. @peternlewis, any objections or comments? Thanks. I have corrected my OP. No there should not be a “big fat warning” not use %Return% or \r. There can be a note to ensure you know which line endings you want to use, and that generally scripts and files will need %LineFeed% or \n, while clipboards probably want %Return% or \r, and anything you write should generally try to handle either. With minor amendments, the info in your Summary previously is appropriate for the token pages. @peternlewis, would you agree that it is better to use a LF unless you have good reason to do otherwise, and always use LF in Shell Scripts? Nope, I use %Return% frequently (I use it in 37 different macros). I don’t use %LineFeed% anywhere. %Return% is generally fine in any macro except when dealing with variables that will be used in shell scripts. 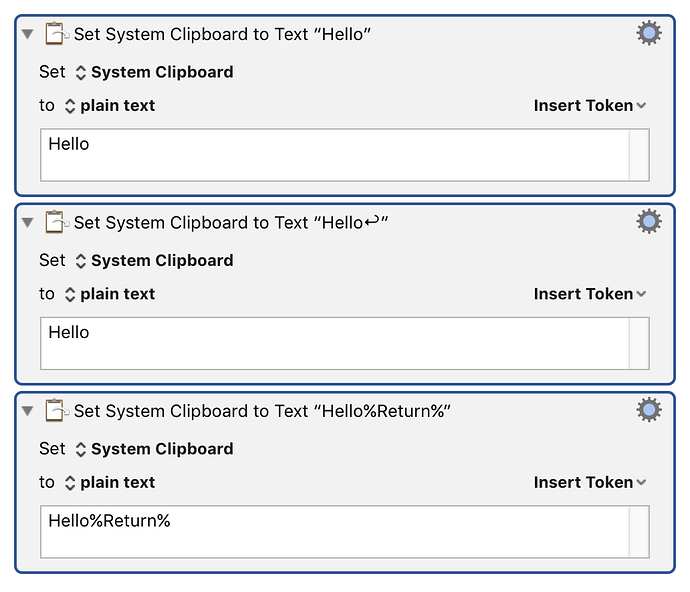 For Insert Text by Typing or Pasting, or for setting the clipboard, %Return% is fine, and probably more correct than %LineFeed%. There are quite some users who don’t know that there different types of line breaks. It is not uncommon to use Shell Script actions, even for new users. When the variable value with the %Return% token gets passed to the Shell Script action the action most likely will fail. The user has no clue why it is failing. When a user is using the %LineFeed% token (or \n) in cases where — according to your explanations — the %Return% token would be “more correct”, chances that something will fail are rather low; at least lower. Indeed, since I’m using KM I literally never used the %Return% token or \r and, off the cuff, I can’t remember a single problem because of that. That being said, I appreciate your above explanations where and why a CR would be more correct. Didn’t know that. Personally I advocate using linefeeds everywhere, since that’s the UNIX way of doing things. I only use alternative end-of-line characters when genuinely needed. Mixed end-of-line characters (CR, LF, CRLF) are where macOS and Apps tend to hiccough most often. Until version 12 came out just recently BBEdit used carriage returns internally — even when it was set to use other end-of-line characters — and it would convert them appropriately as necessary. There were a number of instances (particular when scripting) where you might unexpectedly get carriage returns, and this as @Tom has noted can cause shell-scripts a ton of grief. \n and \r are synonymous in BBEdit’s search and replace engine. In BBEdit 12 they stand solely for linefeed. It only finds \x0A (LF), except the last CR which is preserved. File hex dump (as shown here) shows CRs. Nope, I use %Return% frequently (I use it in 37 different macros). I don't use %LineFeed% anywhere. That is very interesting. I don't use either %Return% or %LineFeed% in any of my production macros (have used both in testing), and I've never encountered an issue or negative feedback from other users. So I really have not found any need to use %Return%. I have used the Type Keystorke with a RETURN key press often, and it always works. This is usually in the context of choosing a menu item, or creating a new line in an app. Perhaps KM is sending an ASCII 13 (0x0D) in this case to the app? 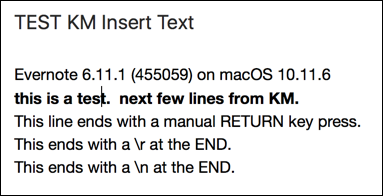 It is also interesting to note that the KM Editor seems to use LF when a manual RETURN key is pressed in text areas of KM Actions. As you can see, a match for \n was found for every line, even the line where I had a %Return%, followed by a manual RETURN key press. Note: I did NOT use a manual RETURN at the end of these lines. Using _either_ `\r` OR `\n` (alone) resulted in the desired/expected outcome. 2. When I do want to use it, I find it more convenient, less verbose, to use `\r`, OR, if it is a KM text area, just use manual RETURN key press. * When typing text in a KM Action and you need a new line, just press the RETURN key. * Don't use a token or symbol for CR or LF if don't really need to. * If they must enter a symbol (which should be rare) for new line, the use `\n` unless testing shows it does not work. Then use `\r`. **Personally**, I will continue to use either manual RETURN key press OR `\R` everywhere in KM, unless that fails and I have a specific reason to use `\r`. I have no use for either `%Return%` or `%LineFeed%`, as they both just require more typing, are verbose, and have no benefit over using `\r` or `\n`. I have used the Type Keystorke with a RETURN key press often, and it always works. This is usually in the context of choosing a menu item, or creating a new line in an app. Perhaps KM is sending an ASCII 13 (0x0D) in this case to the app? You're talking Apples and Oranges here. The Return key simulates a keystroke, which is a key code. The resulting behaviour is dependent on the receiving application, it might OK a button, insert a CR or a LF or a CRLF, move to a different field, whatever. 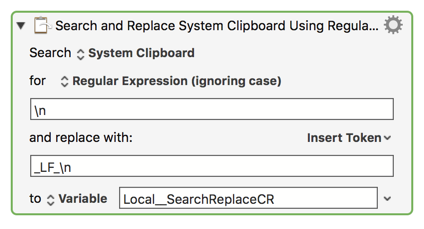 Some applications I have encountered have failed with LF line endings on the clipboard. When I do want to use it, I find it more convenient, less verbose, to use \r, OR, if it is a KM text area, just use manual RETURN key press. Yes, but you know what a \r is. The reason I typically use a %Return% is because it is much clearer to a much wider number of people, particularly where the data is a single line with a trailing line ending. Because you have to look very closely to see the difference between these two actions, but the third is obvious. I tried every application I have open, and all worked with either %LineFeed% or %Return% on the clipboard. I have no use for either %Return% or %LineFeed%, as they both just require more typing, are verbose, and have no benefit over using \r or \n. This is completely true for everyone who is fully familiar with \r and \n and other backslashed characters. I wouldn’t quite go that far. There are times and places where escaped single-letter-tokens are very hard to read and likely to be missed, so now and then the verbose form is preferable — even for those of us who’ve been using the short-form tokens for decades. Peter — thanks for giving us choices. You’re talking Apples and Oranges here. The Return key simulates a keystroke, which is a key code. The resulting behaviour is dependent on the receiving application, it might OK a button, insert a CR or a LF or a CRLF, move to a different field, whatever. Actually I’m not talking apples and oranges. I’m talking about what is easiest and most natural for most users. Using the Type Keystroke allows the user to do what is natural, without worrying about whether a CR or LF is generated. I submit that most users don’t care whether a CR or LF is generated, they just want o get the job done. The main point I have been trying to make, is that for most users, who want a new line in text, pressing the RETURN key is the most natural thing to do, and don’t worry about what character code is generated. If you want to activate a menu item which has been selected, then again, using a Type Keystroke with RETURN key is the most natural, easiest thing to do. It is good to have the %Return% and %LineFeed% for those few occasions when the user may not want to show an actual new line in the UI, but to generate one in the text. My other point is rarely does the user actually need to use the %Return% token, so let’s not mislead the user into thinking they should do that by default. Using \x0D worked for me, but it was a real challenge to get a CR into BBEdit. Running BBEdit 12.0.1 (400010) on macOS 10.11.6. This works because your first line break is a LF. I only find \x0A (in the editor window). Tom, I think the issue is that any line that ends with a CR is changed to a LF when it is pasted into BBEdit. None of your scripts were able to place a carriage return into BBEdit (for me). I just copied some text from Script Debugger (while making sure the first line was a linefeed) and pasted into BBEdit. Then I deleted the linefeed, so I had only carriage returns. BBEdit still found them with \x0D. Feel free to send me a document that exhibits the problem off-list, and I’ll be glad to test some more. You’re not looking at the file with invisibles ON to determine if there actually ARE carriage returns are you. So there ARE NO carriage returns to search for. No wonder \x0D doesn’t work for you, and you’re only finding linefeeds with \x0A. You’re running into the issue that BBEdit 12 uses linefeeds INTERNALLY — just as it used to use carriage returns (I do believe). Yep, for me either. And that was the whole point of the scripts ;): to show that there is no way to get CRs into the BBEdit editor. With excactly one exception: the first line break is a line feed. Those CRs are indeed found by \x0D. But those CRs shouldn’t be there, I think. Normally BBEdit doesn’t allow different types in one document, not in the editor, nor in the file on disk (check the Hex dump of your file). And that’s also why I was surprised by your statement that you could find CRs with \x0D. But know I realize that with the \x0D search you referred precisely to those “bogus” CRs in the editor that BBEdit fails to LF-ize, not to the CRs in the file, or whatever I had thought. Given the behavior of BBEdit, I don’t think I’d use it to find/change CR in text, either from the Clipboard, or from a file. AppleScript using Satimage.osax change command. Probably some unix tools you can use in a Shell Script, but I don’t know them. There are probably others, but those are the ones I’m familiar with.